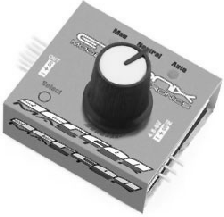 Following a link posted on the NGF forum, I purchased a control board and a pack of 10 small servos. Thinking about it, I realised that 10 servos could draw a fair whack of current. I can’t quite, realistically, think of a situation where I would ask them all to be on the move at the same time but since the things can be used in parallel as it were, I decided that a suitable power source was also justifiable. An eBay search brought up a suitable unit rated at 5 volts and capable of 10 amps of current, so, that was acquired also. The next stage is to put the control board together. Chasing it up a little I found the manufacturers website. It’s made by adafruit. A strange company they are, with a broad and peculiar range of products. However, I have used some of their items before and found them to be reliable. Chasing round the site, I finally found a link which brought me to this: details of the board including construction. 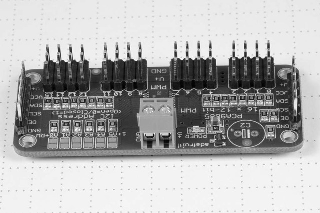 Yes, construction, I would need a soldering iron – there are around 60 solder joints to make on this thumb sized board! I am well practised in the soldering art so it didn’t take long to put it together. They come in a multitude of flavours, in a range of different prices and under many names. I’ve seen them called ‘Servo Tester’, ‘Servo Exerciser’, ‘Servo Setter’ and even ‘Servo Thing’. Prices range from £1:99 to £9:99. Don’t pay big money for one, though you may wish to pay the premium for a local supplier – the £1:99 one was from Hong Kong and was going to take 3 to 4 weeks to arrive. The device has three functions. In mode 1, rotating the knob will cause the attached servo to move appropriately. 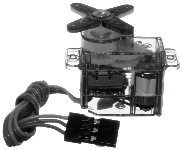 Mode 2 sets the servo to its starting, or neutral, position. Mode 3 will cause the servo to cycle between approx. 45degs and 135degs. The neutral position is at 90degs. Under program control the servo will be able to cover approximately 0 to 180degs.